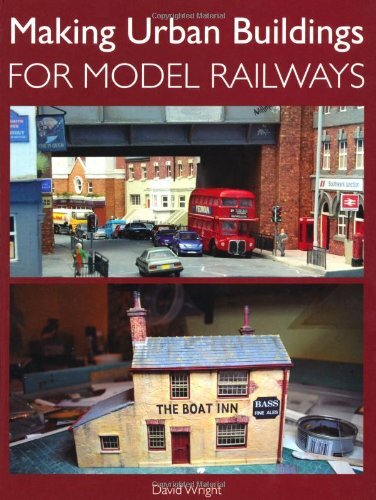 Making Urban Buildings for Model Railways by David Wright is aimed at all those modellers who wish to create a model railway set in an urban landscape. Great words from a master of his craft. Easy to read and easy to learn. This book is highly recommended to any modeller at what ever level. Making Urban Buildings for Model Railways covers the selection and the construction of a wide range of urban buildings, and presents many detailed photographs of real buildings from which the modeller can gain ideas, identify specific features and draw inspiration. Special attention is paid to modelling architectural details and to the effects of weathering. Scratch-building techniques and materials, as well as ready-to-plant buildings and kits are covered. In addition to the buildings themselves, the author also considers the urban setting and infrastructure, and demonstrates how to construct roads and pavements, create authentic street scenes, and make realistic models that accurately reflect, for example, urban decay and dereliction. Finally, consideration is given to persepctive modelling, a concept that provides the modeller with an opportunity to make much better use of a limited amount of space. David Wright is a professional artist and model maker who has written several articles in the railway modelling press. He is well known at many of the major railway modelling exhibitions where he is especially renowned for his informative demonstrations and theatre presentations. Making Urban Buildings for Model Railways is David Wright’s second book for Crowood, his first being the highly acclaimed Making Rural Buildings for Model Railways.